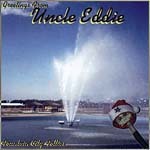 Uncle Eddie "Fountain City Follies" - Punk super funk a billy minutemen style with a flair of driving rock slides. Funny and seriously good music all at the same time. Assuming the position that music is supposed to be fun these guys will make you get up out of your lazy boy and shake it. A dash of jazz influence and the flavor of funk. "Love and Peace Won't Work This Time"
Windell Greene "Love and Peace Won't Work This Time" - There are a lot of things that just don’t work in this world and this band is NOT one of them. Punk rock at its best with just the right amount of frosting not too make it over sweet. With enough surprises to keep you wishing that Soul Asylum would get pissed again. Sit right back and wait to take out your 3D ear goggles for the hidden pleasure you will find if you listen just long enough to hear the rainbow. If we all had ear buds instead of taste buds this would leave you drooling in the ears. Is there a band you like that you don't see here ? Send us your requests ! Send me an e-mail when you update this web site. Send me the printed edition of d-daycd (issued bi - annually).